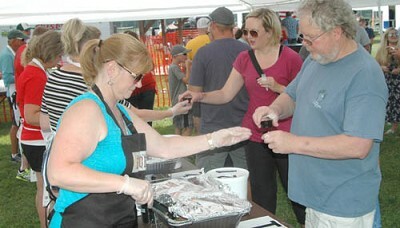 Stewartville and area residents taste-tested samples from seven BBQ chefs at the second annual People�s Choice Pulled Pork competition at the BBQ Music Fest at Bear Cave Park on Saturday, July 28. Leon Lipkie of Stewartville, owner of Lenny�s BBQ, was the winner of the pulled pork contest. Tim Felton of Little Tim�s Smokin� BBQ of LaCrescent, far right, was the overall winner of the Bear Cave Backyard BBQ competition at the BBQ Music Fest on Saturday, July 28. Dave Stevens of Bone Hill BBQ of Racine, second from right, placed second. Wade Goss of Moonlight Meat Rubbers of Stewartville, second from left, and his team, Jeremy Jackson, holding trophy at far left, and Ben Borchardt, third from left, placed third. Jerry Fossum sat under the shade of a large tree at Bear Cave Park, pondering why he enjoys barbecuing brisket, ribs, pulled pork and more. It didn't take him long to come up with an answer. "We're fat guys, and we enjoy food," he said with a laugh.